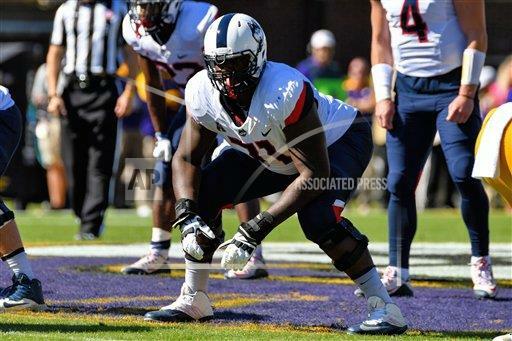 A pair of UConn offensive linemen have been signed an undrafted rookie free agents by NFL teams. Just think about that statement for a bit while pondering the well-documented offensive line struggles at UConn in recent years. Andreas Knappe was signed by the Atlanta Falcons shortly after the NFL draft came to an end. Today came word that after bringing in more than 50 players for tryouts, Richard Levy was one of three tryout players signed as free agents by San Francisco. Levy was the starting left tackle as a sophomore and junior but with the emergence of redshirt freshman Matthew Peart, he moved to guard as he started all 37 games between 2014-16. I haven't heard whether Levy was playing tackle or guard for the 49ers. I took over the day to day coverage of UConn football in 2013 and don't recall a rookie offensive lineman being on the 90-man roster of an NFL team during that time. I did some checking and it looks like the last time that happened was in 2012 when Moe Petrus was signed by Tampa Bay and Mike Ryan by Cincinnati. By my count, 11 players on UConn's 2014 team - a roster that former coach Bob Diaco managed to squeeze one whole win against a Football Bowl Subdivision team - have taken part or will take part in NFL training camps (not including tryouts at rookie camps). Also, defensive lineman Mikal Myers (Baltimore), kicker Bobby Puyol (Baltimore) and cornerback Jhavon Williams (New Orleans) got looks in rookie camp as did Reuben Frank with Detroit in 2015 while a talented group of seniors, who were freshmen on the 2014 team, figure to add to that list in 2018.